With the passage of hurricane Irma there is much talk about the victims in Florida. But when the hurricane first came over the Caribbean. Hovering over countries like Puerto Rico, Cuba, Haiti and the Dominican Republic. The Islands are small and not as developed as Florida. So the effect of a powerful hurricane becomes even worse. I’ll be focusing in on the effects of the hurricane on Cuba. In Cuba the Minister of Agriculture stated that there has been a lot of damage to the farm lands and livestock facilities. The government has even tallied up the amount of hens killed and put that estimate at around 71 thousand. Of the island’s plantations the banana plantations were most affected with most banana plantations being damaged. But the government says that they are attempting to distribute the remaining supplies to heavily damaged places first. Looking on the infrastructure in Havana it can be easily said that buildings were heavily damaged.With most buildings in Havana crumbling and lacking windows. 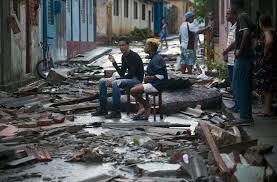 The hurricane, which was a category 5 in Cuba, dominated the island. The island’s infrastructure is flooded and making the terrain uneven. Also making Havana’s sewer system, an already bad system, worse you can smell the sewers above ground now it on the surface. The cobblestone floors of Cuba, by flood waters, can be moved effortlessly shifting and warping the positions of buildings. The overall age of the Havana was surely a determining factor in the destruction.